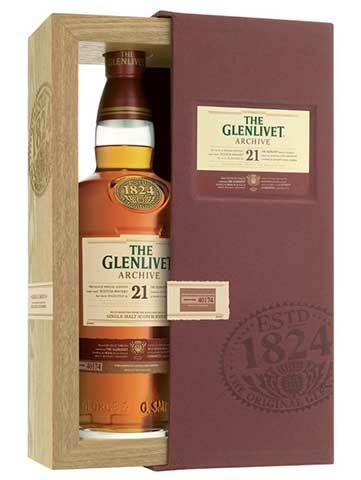 The Glenlivet 21 Year Old is produced in small, bespoke batches, each cask is nosed and approved, making every batch unique. COLOUR : Amber with sparkling copper shades. NOSE : Aromas of dried fruit with a sherry influence. PALATE : Cinnamon and ginger with a syrupy mouth feel. FINISH : Lasting and warm with a hint of toasted hazelnuts. ‘Gold’ Speyside Single Malt 19-25 yr, Scotch Whisky Masters 2013. ‘Gold’ Outstanding, International Wine & Spirit Competition 2013. ‘Silver’ Speyside Single Malt 19-25 yr Scotch Whisky Masters 2014.